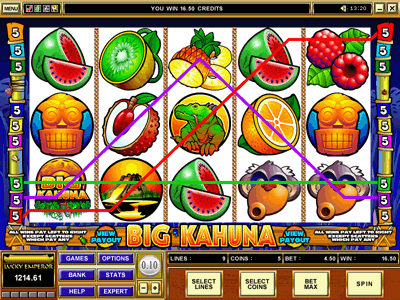 Big Kahuna is a five reel, nine payline, and forty-five coin slot machine that is a very popular bonus slots game. Big Kahuna has a scatter and a wild symbol. Big Kahuna has two Bonus Slots Features, the Pick a Mask bonus game and the Volcano bonus game. The Big Kahuna symbol is a wild symbol. It is only wild for fruit symbols. The Big Kahuna symbol does not substitute for a Chief or Lizard symbol to complete winning combinations, or the Mask and Volcano symbols to activate the Bonus Features. You can play Big Kahuna Bonus Feature Slots at King Solomons Casino.